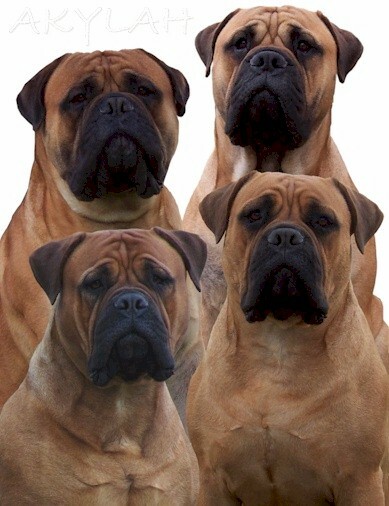 The purpose of Akylah and Willowbend Bullmastiffs is to breed quality puppies, of correct type, of good health, and with superb temperament. We strive to consistently improve the breed, and to produce dogs which are beyond reproach to share our lives. All our dogs have their eyes examined by a specialist ophthalmologist and are hip and elbow scored before breeding. In an effort to promote good health and increase longevity Akylah Bullmastiffs feed our dogs a well balanced, all natural, biologically appropriate raw diet consisting of raw meaty bones, fish, chicken, lamb, beef, venison, ostrich, tripe, liver, eggs, vegetables and fruit. Raw feeding has many benefits, including optimum health, both physically and psychologically. Please click here for more information and a sample diet. Our dogs are our family and live with us, in our home; we endeavour to do our very best for them in every way. For information on our upcoming litters please see our puppy page. Puppies are sometimes available to approved homes. For more information, pictures, and pedigrees of our current dogs please click on their names below. Please click on the names below for more information on dogs that have previously graced our lives and breeding programme.